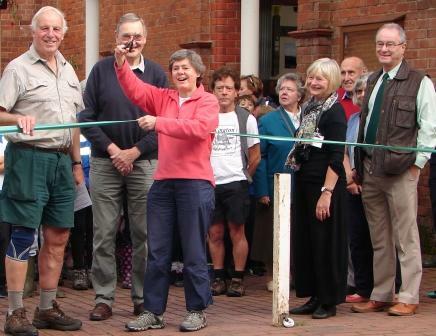 Last Friday I cut the ribbon to launch the Wyche Way long-distance path during Kington’s four-day walking festival, and walked the first few miles. 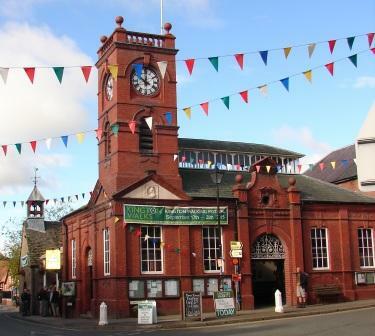 The 80-mile way runs between Kington, a Walkers Are Welcome town in Herefordshire, and Broadway Tower in Worcestershire; it can be walked in seven stages via Great Malvern. It links Offa’s Dyke Path with the Cotswold Way and, with the addition of the Wales Coastal Path, Glyndwr’s Way and Shakespeare’s Way, it provides the final link for a continuous promoted walk between Aberystwyth and London. It was invented by the energetic Guy Vowles of the Cheltenham Rambling Club, assisted by Jim Mason, a councillor in Winchcombe, Gloucestershire. It is called the Wyche Way after the old Saltway crossing of the Malvern Hills, known as the Wyche Cutting. 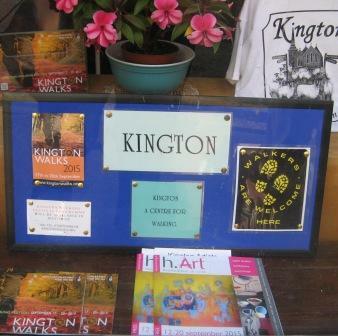 The launch was held in the Place de Marines at Kington which was packed. 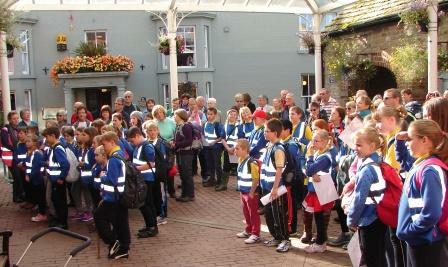 About 50 children from Kington Primary School were there to walk the first mile of the route. Sam and Thelma Phillips had come from Ross on Wye—Sam is the national chairman of Walkers Are Welcome. Barry Trumper kindly took photos which I have used on this blog. The mayor Celia Kibblewhite welcomed us and spoke of the importance of the path network. I talked a bit about Walkers Are Welcome and how Kington was a walking hub. Since it had become a Walkers Are Welcome town about five years ago the town had received a welcome boost from visitors and now has a fresher, more positive air about it. The walking festival was an inspired initiative to celebrate the local paths, and now we have the new long-distance route which sets off from here. All these put Kington firmly on the map for walkers. So I cut the ribbon and declared the route open, and we set off through the town and across the fields. 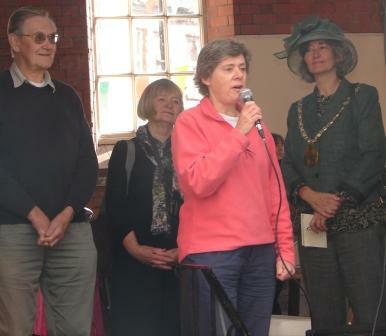 I was delighted to see my friends Marika Kovaks and Arthur Lee from the Hereford Ramblers. Marika came on the walk and she and I had a good chat. The paths around Kington are in good order, thanks to the unstinting efforts of Open Spaces Society trustee and local correspondent Peter Newman. 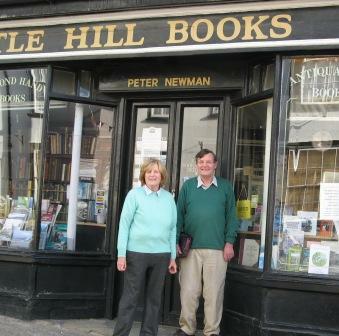 Peter owns the second-hand bookshop in Kington and spends every spare moment campaigning for public paths. 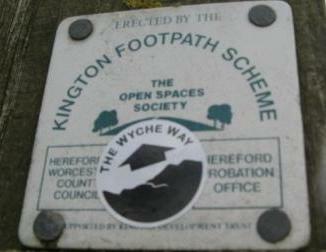 Twenty years ago he established the Kington Footpath Scheme, in partnership with Herefordshire Probation Office. People who are on Community Service Orders from the courts come out with a supervisor to do work on the paths. The Wyche Way heads out of Kington in a south-easterly direction up onto the ridge at Rodds Wood (grid reference SO312552) commanding fine views west over the town and beyond to the Radnorshire hills. There is refreshingly little manmade intrusion. There were some difficult stiles along the way, in the neighbouring parish of Lyonshall. Peter explained that because the parish council is receiving money from the county council to do path work, he cannot take the Community Service Order team there. However the parish council ought to be spending the county’s money to do the work. I hope that the inclusion of these paths in the Wyche Way will encourage the parish council to act. After a pleasant morning’s walk, we reached the Bells Inn at Almeley. I had to leave the walk here, but I had spent a happy morning enjoying the beautiful, unspoiled countryside around Kington. There are some great pictures on the Kington Primary School blog. 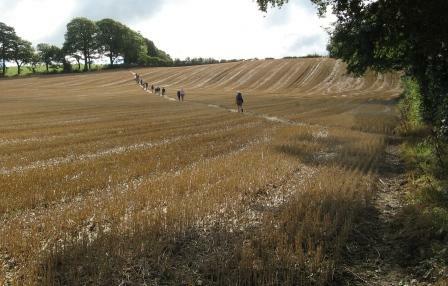 This entry was posted in Ramblers, Ramblers' president, Walkers Are Welcome Towns, walking and tagged Broadway Tower, Footpath, Kington, Open Spaces Society, Ramblers, Walkers are welcome, walking, Wyche Way. Bookmark the permalink.